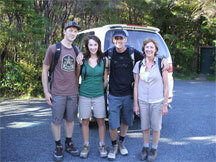 Fancy a genuine kiwi style family holiday adventure? Then this one's just for you. Day One: Your family adventure begins with an exciting and scenic 30 minute flight from Auckland Airport, across the Hauraki Gulf to Great Barrier Island. We'll meet you on arrival and show you to your rental car. Be sure to visit the I-site at the Claris Airport and grab all the activity brochures and explorer maps you'll be needing. Time to check out your accommodation. Great Barrier Lodge is positioned right on the edge of beautiful Whangaparapara Harbour. With awesome restaurant & bar facilities and kayak hire available on site, the lodge offers the perfect opportunity for a fun family getaway! Want to get on the water? Hire a kayak right at the lodge or visit Shiny Paua Stand up Paddle Boards, located just around the corner from the lodge. They offer board hire, harbour tours and lessons for those that need a few helpful tips to get up and going. Perhaps you'd rather get out there and explore some stunning Barrier Bush... You'll find Kauri Falls within 35 minutes from the lodge... It's all right on your doorstep! Day Two: Grab your towels and something warm for later on - today you're off on your Adventure Cruise with Sundancer Charters. Your skipper will be waiting for you to board by 10am. The cruise includes a 3 - 4 hour boat tour departing from and returning to Whangaparapara with a BBQ lunch on board. 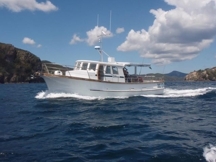 It incorporates sightseeing in the Whangaparapara Harbour and explores the beautiful Broken Islands area, the entrance to Fitzroy Harbour, Man O War passage and Kaikoura Island. Your skipper will find a nice sheltered bay where the kids enjoy a swim while he prepares a scrumptious on-board lunch. Keep an eye out for dolphins and whales on the return journey to Whangaparapara wharf. Day Three: You can't come to Great Barrier Island and not visit the natural hot springs for a hot soak. You'll find the car park on the Whangaparapara road. Allow yourselves 40 minutes walking each way. Don't forget the Windy Canyon bushwalk either, it's amazing! And only minutes from the car park at the top of Aotea Road on the way north to Port Fitzroy. 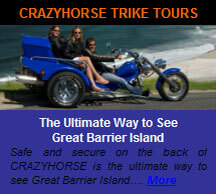 There's so much to do and explore on Great Barrier Island. Just be sure to make it back to Claris Airport in time for your 5.00pm flight home. You can try a little stand up paddle boarding with Shiny Paua Paddle Boards in Whangaparapara, go for a horse ride along Kaitoke Beach or take a cool ride with Crazyhorse Trikes. Let us know if you'd like to add-on any of these activities and we'll build them into your package. This package includes all return flights from Auckland, 3 days car rental, 2 nights accommodation at Great Barrier Lodge and a Sundancer Adventure Cruise with a scrumptious on-board lunch provided.